Finding the problems before they become major. Non-Destructive Testing (NDT) is the term given to the process of inspection of either a component or structure, where the item being tested is not changed or destroyed. This means that after inspection, the component can still be used for its originally designed purpose, should no fault be detected. Race car teams use NDT techniques to assess whether or not a component should be replaced, and whether it is up to scratch even before it is first used. If you are building a very high performance car, crack testing of transmission gears, con-rods and even crankshafts can all be carried out. But there are a variety of different forms of NDT, some of which are more suitable to specific applications than others. Visual Inspection may be used to determine the condition of a welded joint or a component. This process doesn't require the use of special equipment, however it does need a good knowledge of the component being inspected and weld quality. To carry out visual inspection, good lighting sources should be used together with good vision on the inspector's part. Magnification equipment may also be used to assist the inspection. The item being inspected should be thoroughly cleaned prior to the inspection - this may include simply wiping the item down with a cloth, through to blasting and chemical cleaning. The first of the surface methods is Liquid Penetrant Inspection. This method is used to detect surface breakage and can be used on any material. The item being tested is thoroughly cleaned and then coated with a liquid which is drawn into the surface. After sufficient time has elapsed for the liquid to be drawn into any cracks, the excess liquid is removed and a second liquid (which acts as a developer) is applied. The developer draws the penetrant from the crack, making the crack visible. Some penetrants are coloured and require good fluorescent white light to be seen, while others require a darkened room with the inspected part illuminated by ultraviolet light. Acoustic Emission Monitoring is another method of NDT which may be used to detect flaws not able to be seen with the naked eye. This method is useful in testing fibreglass structures, storage tanks, welds and rotating machinery. An microphone is attached to the item being tested and the sounds of the item are analysed while the item is placed under load or into use. 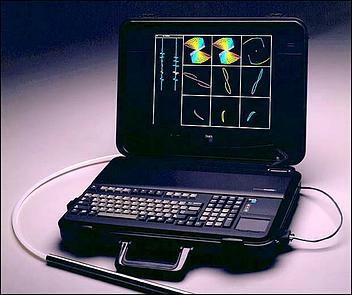 The analysis is performed using computer based equipment. The sounds, which are listened for, include noise from friction, crack growth, leakage and changes in the material which may result from corrosion. The equipment picks up sounds which are inaudible to the human ear and so can detect minuscule changes. The advantage of this type of NDT is that the whole structure or component may be tested while it is in use. This means that disassembly time and cost is saved and the process may be used for ongoing monitoring where applicable. A method which can be used to find defects on the surface and near the surface in ferromagnetic materials (ie those that can be magnetised) is Magnetic Particle Inspection. This method uses the application of fine iron particles to the surface of the item which has been temporarily magnetised. The principle is that the fine iron particles will form along the lines of the magnetic force from the magnet. These lines will be distorted by flaws and thus the presence of the flaws will be revealed. This method is best suited to finding surface flaws but can also locate sub-surface defects. The ability to detect any sub-surface defects diminishes with the depth of the defect. There are a number of different ways which the magnetism is applied, as there are also for the application of the fine metal particles (wet, dry, in liquid, coloured or fluorescent). This method may only be used on electrically conductive materials. 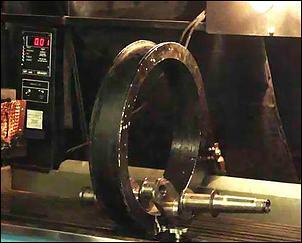 An energised coil is placed near the surface of the test item, inducing eddy currents into the item. The currents are affected by the physical properties of the item being tested, which include its conductivity, magnetic permeability, thickness, surface and presence of defects. Changes in the property of the component, such as a defect, then alter the impedance of the coil, which in turn can be measured. A difference in the impedance implies a fault, such as a crack or void. This method may be used on components or surfaces which are painted or otherwise coated as the coil does not actually need to contact the component being tested. Further, this method may be used to test components of different depths and thickness. This process utilises sound waves to measure material thickness. Pulsed beams of high frequency ultrasound from a transducer are directed at the item being tested. A screen is used to display the amplitude and the time taken for the pulse to return. Changes in the signal are indicative of varying material thicknesses, or in the absence of this, a defect. Ultrasonic testing is often used to compare specimens that should be identical - if one gives a different sonic signature, it may be because of the presence of a defect. 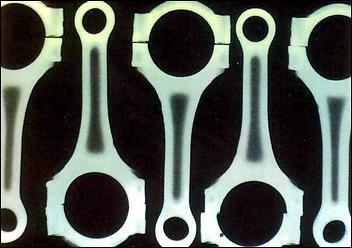 Radiographic Inspection uses X-Rays or gamma rays to examine a component or surface. The X-rays are produced using high voltage X-ray machines and gamma rays are produced using radioactive isotopes. The rays are directed at the item to be tested so that they pass through it - the resulting image is then captured on film. The film is processed and the result is a series of grey shades which will show any defects (as the ray passes through them differently to the surrounding material). 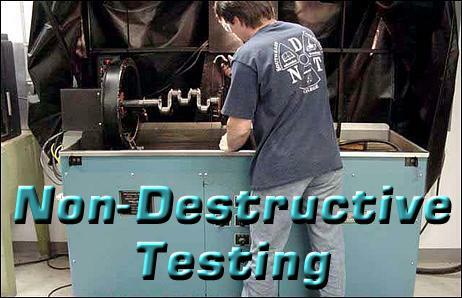 In addition to the above NDT techniques, there is also a process used which is called Optical Non-Destructive Testing. This process is suitable for testing items such as composite panels, turbine blades and tyres. The inspection is based on the capture and processing of images of a component which is illuminated by laser light. A control image is taken, then the component is subjected to a change such as deformation, pressure modification, loading or heating and a second image is taken. A difference image is then generated, with information about defects being the result. Despite the complex nature of the testing procedures, most of these techniques are within the budget of the enthusiast. For a special engine, for example, having the rods X-Rayed for voids and Magnetic Particle Inspected for cracks is cheap insurance. Having a block ultrasonically tested to determine how much meat is left within it before embarking on a big over-bore is similarly a good thing! Finding testing facilities is as easy as looking in the Yellow Pages - in Australia, look under 'Inspection and Testing Services'.